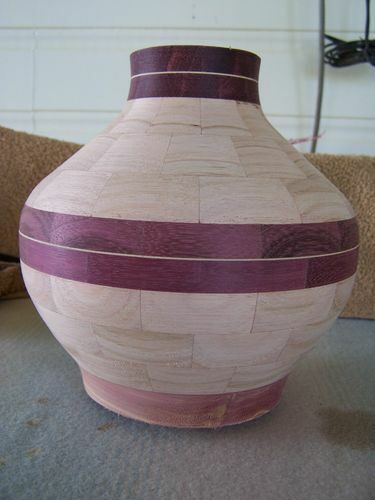 Purple Heart and Tasmanian Oak Segmented Vase #1: Start of some fun. I have started working with segments amongst all the other things that I do. This is a very interesting and challenging thing for me, and I think that I was conned by my mate “Rockbuster” into trying this. He is so good that I just had to have a go myself. This particular vase is my third piece but the first two were pretty basic. Even this one is basic compared to some of the “STUNNING” pieces around the traps, but Hey, you have to start somewhere don’t you. I tried to send a photo to Jim Jakosh but his ISP has a block on any emails with attachments so the only way I can show him and my other Buddies is to do this. The process I used on this piece so far, was to make all the rings and glue them together. I faced one side of each ring using my Cole jaws and then glued that flat face to the base and then faced the outside. This method continued for each of the ten rings. I then turned the outside to shape and it has been sitting on a shelf since then for two reasons. 2. to allow the Purple Heart to oxidise and go purple again. It is quite brown when first worked. So there it sits. Waiting Waiting Waiting? ? ? Hey Bob, Got to North Carolina today after a long 7 hour drive but now I’m relaxing taking in your beautiful work! Looks great so far! What are the measurements? Hey Bob, Got to North Carolina today after a long 7 hour drive but now I m relaxing taking in your beautiful work! Tony, it is 7.25in tall and 7in diameter. You certainly done a great job Bob. Can’t wait to see the finish on it. Stunning at the very least. Nice one Bob, a great start to segmenting, look forward to seeing more.